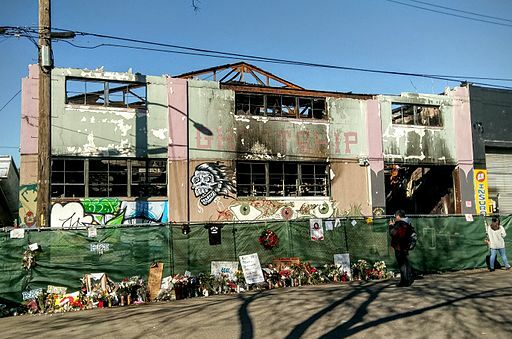 OAKLAND, Calif. (CN) – Ghost Ship warehouse owner Chor Ng has fled the United States for China, according to an attorney for one of the defendants facing manslaughter charges in connection with the deadly December fire at the site. “It is quite clear she fled to China,” Curtis Briggs, who represents Ghost Ship defendant Max Harris, said outside an Alameda County courtroom Friday. Harris and Ghost Ship co-defendant Derick Almena were expected to enter not guilty pleas this morning, but lawyers postponed their joint arraignment to July 7. However, Keith Bremer, an attorney with Bremer, Whyte, Brown & O’Meara who represents Ng in the civil wrongful death lawsuits that have been filed over the fire, shot back in a statement that Ng is not in China. “I have seen reports asserting that Ms. Ng is in China. That is not accurate. Ms. Ng continues to reside in the Bay Area,” he said. Although Alameda prosecutors have not charged Ng, no one has heard from her since the Dec. 2 fire that rapidly engulfed an Oakland warehouse and killed 36 people attending a dance party that night. Many speculated that Ng would be criminally charged – she collected rent from as many as 25 residents living in the building through master tenant Almena, and city records show her daughter managed the warehouse for her – but Alameda County prosecutors suggested last week that there may not be enough evidence to charge her. Nonetheless, Briggs laid blame for the deaths squarely with Ng Friday. Harris and Almena were arrested June 5 and criminally charged with 36 counts each of involuntary manslaughter – one count for every person who died in the fire. Prosecutors accused them of knowingly creating a “fire trap” by allowing individuals to illegally live and throw parties in the warehouse, making repairs without permits and stuffing the building with flammable materials without taking basic fire safety precautions, such as installing lighted exit signs. Prosecutors claim Harris, who lived at the Ghost Ship and planned the doomed Dec. 2 party, blocked one of only two stairwells in the building while prepping for the night’s festivities, leaving concertgoers on the second floor with only a homemade, ramshackle staircase as an escape route. The Ghost Ship did not have the proper permits to be used as a residential space or an entertainment venue. Yet as many as 25 artists and musicians lived in RVs and improvised bedrooms on the building’s first floor, and 100 people attended the concert on its second floor the night of the fire. While Briggs blamed Ng for the deaths Friday, Almena’s defense team has accused prosecutors of bringing criminal charges against his client to cover for the “real culprits” – Pacific Gas & Electric, the Oakland Fire Department, and city building inspectors – who they say failed to monitor the dangerous flow of power to the building and who knew people lived there but took no action. They also accused Alameda County District Attorney Nancy O’Malley of charging Almena in the high-profile case to advance her ambitions of becoming state attorney general, and of trying to shield the county from liability in the civil suit in which Almena and Harris are named. Bolstering his assertion that Almena is innocent, Serra said that he will likely have Almena take the stand at trial. Prosecutors have denied Serra’s accusations, saying that after an exhaustive investigation, they had concluded that they could get guilty verdicts for Almena and Harris. “Our ethical duty as prosecutors is to analyze the facts and apply the law to those facts, filing criminal charges only when there is proof beyond a reasonable doubt that the defendant committed the crime,” DA spokeswoman Teresa Drenick said in a statement last week. At the July 7 arraignment, attorneys plan to ask Alameda County Superior Court Judge Stuart Hing to reduce Harris and Almena’s $1,080,000 bail. “We’re confident that we can get him out,” Briggs said Friday about Harris’ bail motion, adding that his client has received overwhelming support from the artists’ community since his arrest. Their reaction stands in stark contrast to the backlash Almena garnered following the fire for a perceived lack of remorse for the deaths.